In the XXI century, travel habits and trends are evolving at a truly fast pace, and new areas of our planet are becoming the top destinations, popular among all kinds of tourists. Thereat, the more exotic, pristine and authentic the place is – the better. Sri Lanka belongs to this list of the rising “Asian stars”, as it will offer you an utterly unique experience: untouched nature, fresh air and amazingly clean water, the absence of huge crowds of tourists on the one side, and a fantastic level of service and travel infrastructure on the other. 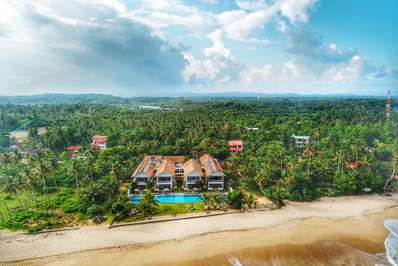 Besides, one of the best ways to enjoy all what this country may offer is to opt for a stay in private holiday villa, hidden on its endless white sandy beaches. That is why we have created this selection of the 5 most fabulous beachfront holiday villas in Sri Lanka! 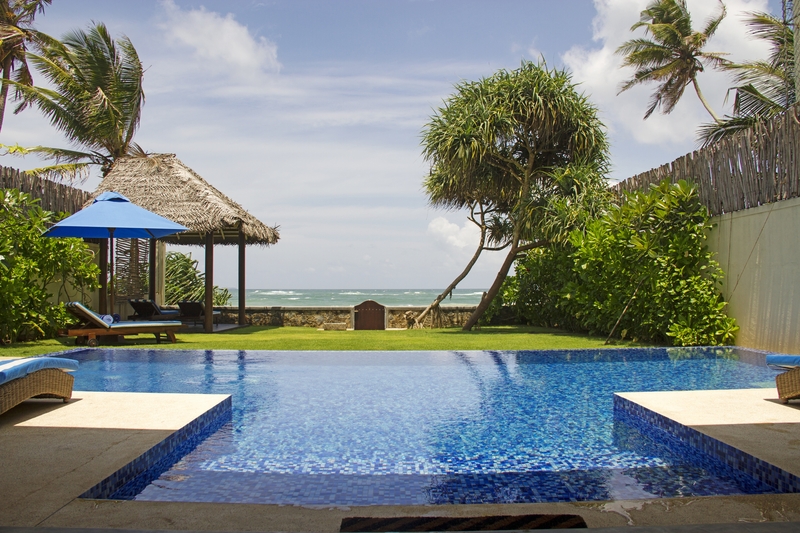 Located in the area of the Southern Galle Beaches, Villa Nilaya represents a perfect holiday villa for couples in Sri Lanka. 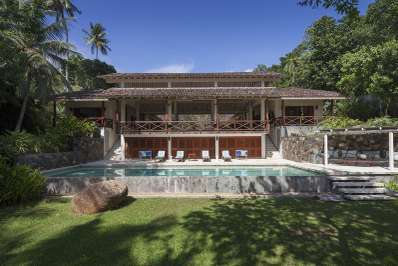 Enjoy your time in the private pool, sunbathe, taste the gourmet dishes prepared by your private chef right at the villa, try snorkelling in the sea, or travel to the charming town of Galle that’s just 15 minutes drive from the property. By the way, the exotic and authentic, yet absolutely comfortable interiors will surely make you fall in love with this place. Be it a romantic stay, journey with friends, or a family getaway in Sri Lanka, Villa Victoria is exactly what you are looking for. It is believed to be one of the top beachfront holiday villas in Sri Lanka for a reason: it is simply perfect from every angle! Beautiful beach area with a hammock and an elegant pavilion where you can enjoy sunsets, fabulous private pool, unique designer interiors, private chef and a lot of space will make your stay in Sri Lanka truly unforgettable. This is a clifftop villa with direct beach access and an infinity pool from where you will be admiring the immensely stunning views of the ocean & taking the pictures that will make your Instagram explode. The villa is designed in the traditional style, which creates a unique, authentic environment. Your private cooking crew will make sure that every meal of you and your beloved is special, which will be further supported by the breath-taking views of the ocean and palm trees. Spacious, elegant and immensely luxurious – this is an accurate representation of the Skye House offering its guests the access to one of the best beaches in the country. 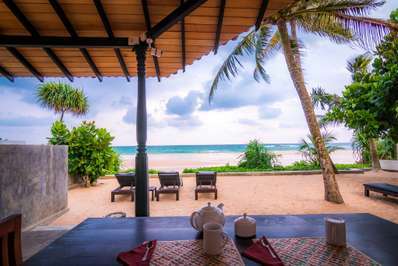 Upper scale interiors, private cooking crew and a huge pool justify its position on the list of the top beachfront holiday villas in Sri Lanka. Suitable for any occasion, this villa will become an ideal spot for a family reunion: just imagine having dinner in front of the pool overlooking the sun fading away in the tender waves. Lovers of nature and spectacular views will crave to stay there forever, as Claughton House has a truly unique outdoor area, which makes it one of the top beachfront holiday villas in Sri Lanka. The beach seems to be the natural extension of the lush green garden, with an open sitting & dining area and a big swimming pool in the middle of it. This villa will surprise you with its beautiful modern interiors and a fabulous cooking crew, waiting for you to try their gourmet dishes from the local and international cuisine. Next articleFive Types of Travelers Who Fall in Love With Bali. Are You On The List?